The Michael Jackson who rises from the mausoleum on Michael isn't all that dissimilar from the one who left us last year. On the first of a projected 10 (yes, 10) posthumous albums, Jackson is heard alternating between his two long-standing personas: the wide-eyed purveyor of idealized love and the embittered, self-pitying victim of a fixated media. His affection for treacle and sentiment still runs rampant, his voice still slips into a buttery soprano, and he still uses rock guitars to indicate "rage" and gospel choirs to announce "inspiration." Jackson, of course, wasn't around to finish the bulk of these 10 tracks, which were recorded as far back as the early 1980s and as recently as just before his 2009 death. But the producers who helped him clearly studied what made Jackson's music so singular. Michael isn't an Off the Wall or a Thriller; by 2009, those days were as long gone as his red zippered jacket. But given its stitched-together makeup  new tracks built around Jackson's voice  neither is it an embarrassing, Frankenstein-pop monster. Against all odds, considering Jackson's iffy output in the two decades before his death, it's a shockingly credible record  a carefully assembled re-creation of his finest moments as a solo artist and a reminder of why we cared about him to begin with. Starting with Dangerous and continuing through HIStory and Invincible, Jackson clearly grappled with ways to reboot his sound in a world dominated by hip-hop. He tried new-jack beats, guest rappers and Notorious B.I.G. samples, which only made his music feel earthbound. In death, Jackson is gliding skyward again. With their crisp rhythms and a dearth of the bombast that bloated so much of his post-Thriller work, the best songs here evoke his music's lithe, whooshing agility. "Hollywood" has the coasting-on-air quality of classics like "Billie Jean," while "(I Like) The Way You Love Me" (an earlier, unfinished version of which appeared on a 2004 compilation) follows in the footsteps of "The Way You Make Me Feel," with warmer, less processed harmonies. That song and "Best of Joy" were both co-produced by Theron "Neff-U" Feemster, whose silky work with Ne-Yo made him a perfect match for Jackson. Intentionally or not, Michael posits the intriguing possibility that Jackson, had he lived, could have made a musical comeback: thanks to acts like Ne-Yo and Beyoncé, R&B has swung back around to his less beat-heavy, more melodic grooves. But if Michael is a promise-filled look at what might have been, it also a reminder that Jackson at his end wasn't the same artist he once was. Down to its vampy vibe, "Monster" works hard to re-create the mood of "Thriller," albeit with the far less scary 50 Cent instead of Vincent Price (and a less memorable hook). The monster in the title represents the paparazzi, who'll "eat your soul like a vegetable," Jackson warns. He harps on that topic both here and on the even more self-important "Breaking News"  a sign that as a lyricist, he was running in circles, trapped in a cramped world of his making. The love songs feel more generalized than ever, and his moralism about the evils of showbiz gets genuinely tacky on "Hollywood," in which he scolds a teen runaway for "giving hot tricks to men." 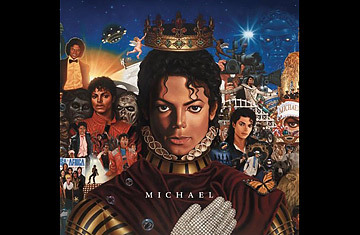 One of the album's most revealing moments comes in "Keep Your Head Up," a wide-screen inspirational ballad that gives us another variation on his "Heal the World" mode. It's about a working mother, but when Jackson sings, almost breathlessly, "I can't even breathe/ I can't even see!" he could be talking about himself. Michael's finest moment isn't the dull current single "Hold My Hand," on which the rapper Akon is featured nearly as much as Jackson. That honor goes to "Behind the Mask." Again, Jackson sounds youthful, energized and alluringly snappish; again, the music has an assertive, effortless drive, aided by a sample from the defunct Japanese electronic band Yellow Magic Orchestra. "Who do you love?" Jackson pleads with a yearning intensity he hadn't mustered in years. Sadly, there's a reason for that: "Behind the Mask" dates back to the Thriller sessions. Much like Thriller did with Jackson's record sales, this vintage leftover casts an imposing shadow over the "new" album  and makes you wonder if the nine albums to come can maintain the unexpected merits of Michael. For now, at least, Jackson receives the acceptable send-off he deserved. See a video of Michael Jackson's movie career. Watch a memorial to Jackson in his hometown.